Crimean Karaites or Karaims speak a Turkic language, close to Crimean Tatar. There seems to be a disagreement as to their origin. 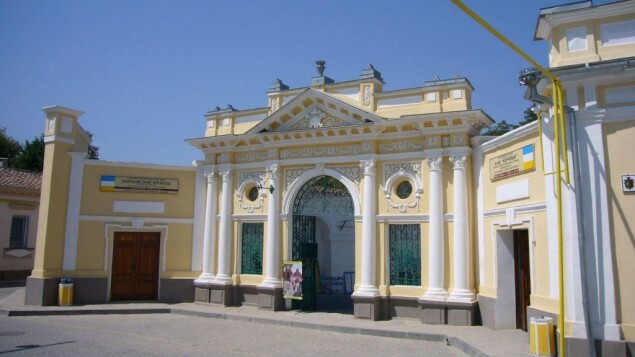 While some regard the Karaites as descendants of Khazars or Cumans, others believe that they were Jews who settled in Crimea and adopted a form of Turkic language. Many Karaites deny their Semitic origins and accept an early version of Judaism, the Old Testament, and reject the Talmud. They escaped persecution during the Nazi occupation of Crimea in WW II, and today about 800 Karaites live in Crimea. Another small group, Crimean Krymchaks also speak a Turkic language but follow orthodox Judaism. They were targeted for annihilation by the Nazis and only a few hundred survived. The article:Crimean Karaites and Krymchacks as Indigenous Peoples of Crimea in Modern Conditions by Borys Babin and Anna Prykhodko. See also a related article, Rights of Indigenous Peoples and Program for Legal Regulation: Experience of Ukraine by Borys Babin and and Anna Prykhodko.